Blowout Sale! 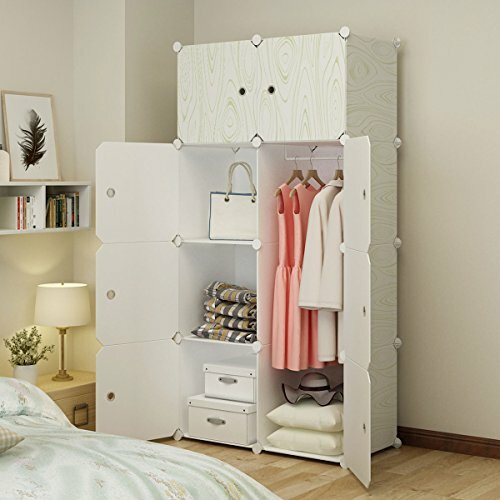 Save 51% on the KOUSI Portable Closet Wardrobe Organizer Clothes Armoire Cube Storage Dresser for Bedroom, Large & Study, Wood Grain Pattern, 5 Cubes&1 Hanging Section by KOUSI at Humble Opinion. Hurry! Limited time offer. Offer valid only while supplies last. KOUSI Portable Wardrobe: 5 Cubes+1 Hanging Section Are you looking for additional storage space? KOUSI Portable Wardrobe will meet all your needs. Are you looking for additional storage space? KOUSI Portable Wardrobe will meet all your needs. Features a large open space, leaving room for clothes to breathe. Made from steel and resin, it is light in weight and easy to clean. Not to mention, unlike fabric wardrobes, it won't degrade over time or collapse, nor will it get moldy or otherwise damaged by humidity, keeping your clothes fresh. - Please inquiry before ordering if you plan to build a custom design. - Please push each cube all the way inward to make it firm when installing. - We can only ship to physical addresses, we can not ship to P.O. Boxes. - Your ordered item will be shipped normally on the next business days. - Your ordered item will reach most places in the States within 2-4 working days. 【SPACIOUS STORAGE CLOSET】Dimensions: 29.1"(W) x 18.5"(D) x 58.3"(H). 1 hanging section and 5 storage cubes offer you extra space for all kinds of outfits and belongings. 【STRONG & STURDY WARDROBE】Each cube or hanging section supports up to 22 lbs. Our wardrobes are made of high quality resin composite materials with steel frame. 【ELEGANT & SMART DESIGN】Our products are designed with classic models and textures so that they can gracefully fit in any rooms with any decoration style. 【SMART & QUICK ASSEMBLY】Hassle-free installation and a guiding video on our Amazon Brand Store Front. You can make custom design with essential parts, which allows various sharps of our products for different space or rooms.